These heavily marketed liquid meals nutrition shakes aren't always the best option for your health. Here's what you need to look for. Supplemental nutrition shakes and drinks can be helpful for people who struggle with a loss of appetite, have difficulty chewing, have trouble preparing balanced meals, or are recovering from surgery or an illness. But these nutrition shakes aren't magic bullets for nutrition. "The danger is that people see a lot of minerals and vitamins and think more is better," says geriatrician Dr. Suzanne Salamon, an instructor at Harvard Medical School. "If you use the drinks as meal substitutes that might be okay. It's not okay to eat a full meal and then drink a supplement, unless the goal is to gain weight or stop weight loss. It's too many calories." Supplemental nutrition drinks provide a healthy balance of protein, carbohydrate, and fat. There are hundreds of varieties that fall into two general categories. Shakes, such as Boost or Ensure, are intended for oral consumption. You can find them on a grocery store shelf. These are formulated to help you meet general nutrition goals such as increased calories and protein. Some nutrition shakes are designed to be compatible with health conditions such as diabetes (Glucerna). Nutrition shakes are usually fortified with vitamins and blended with sugar to improve taste. Formulas are designed for more specific disease states such as cancer, chronic obstructive pulmonary disease, and later-stage kidney disease. These drinks (Jevity, Osmolite) can be consumed orally but aren't designed to taste good, and are often used in feeding tubes. Your doctor will have to supervise use of these. You don't need a doctor's okay to try a nutrition shake, but it's a good idea to ask your doctor if any of the ingredients will interfere with your medications. For example, some drinks contain vitamin K, and sudden changes in vitamin K intake may interfere with the effect of the blood thinner warfarin (Coumadin). These examples offer the ratio of calories, protein, carbohydrate, and fat per serving recommended by dietitian Stacey Nelson of Harvard-affiliated Massachusetts General Hospital. Supplemental nutrition shakes contain more than just healthy ingredients. "You may be getting more sugar than any of the other ingredients," says Stacey Nelson, a dietitian from Harvard-affiliated Massachusetts General Hospital. "But if you can't eat and that's the only food that's palatable, it's better to get the calories." Dr. Salamon agrees. "In that case, substituting one meal a day with a drink won't hurt." Both experts warn that people who can still eat may be risking too many extra calories by consuming the nutrition drinks. That can lead to weight gain and a list of complications associated with obesity, such as high blood pressure and diabetes. Equally concerning is that nutrition in a can isn't the same as nutrition from food. "Even if they're fortified, they still won't contain all of the nutrients a whole food source would," says Nelson. Dr. Salamon questions the types of vitamins and dietary supplements in the drinks. For example, some include selenium. "It's not proved that we need selenium," she says. A potentially healthier option is a shake or fruit smoothie that is food-based and found in the refrigerated section of the grocery store. "These tend to have minimum added sugars and are less processed, and they should not contain excessive amounts of vitamins and minerals, herbs, or other unnecessary supplemental ingredients," Nelson explains. 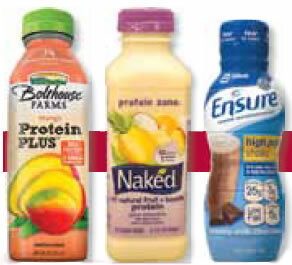 She recommends trying products such as Odwalla Super Protein, Naked Juice Protein Zone, and Bolthouse Farms Protein Plus. However, these tend to cost more than the shelf-stable shakes. No matter which drink you choose, look at the ingredients. Ideally the first few ingredients should be fruit or forms of protein (such as milk). If sugar is the first or second ingredient, there's probably a healthier option. Equally important are the calories. If you're replacing a meal, look for about 400 calories per serving. Our experts advise against using the drinks as snacks, but Nelson says if you must, then don't go above 200 calories. As for nutritional ratios in an 8-ounce serving, look for 10 to 20 grams of protein, no more than 6 grams of fat, and no more than 40 grams of carbohydrate, including sugar.